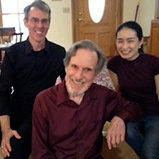 Sunday, April 30 Bend the Knotted Oak Chamber Music Concert 4 Musicians, 7 Hands 2:00pm. Tickets available at the door: $20.00, Under 18 is free. In its latest example of unique programming, BKO Chamber Music will present solo piano music for left hand alone, string trios, and a quartet that combines it all. BKO regulars Mitsuko Suzuki, violin; Ron Carbone, viola; Robert Reed, cello; and artistic director/pianist Uel Wade will perform. Piano music for the left hand alone was created over the last 150 years. It arose from a variety of perspectives: technical development, injury, compositional challenge, and virtuoso display. The history of performance with solo left hand is filled with fascinating characters, monsters of the keyboard who would not give up their careers after losing an arm. Wade will tell some of their stories, along with string-trio stories that put the music into historical context. The trios will relate to the piano works stylistically. For, instance, the Prelude and Fugue for left-hand piano by Max Reger, a Bach enthusiast, will be followed by an arrangement for string trio of a segment of J. S. Bach’s Goldberg Variations. Please call (518) 392-4697 for more information.